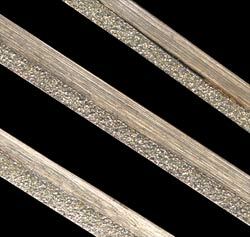 Diamond Laser band saw blades are both durable and efficient. These blades are made of strong stainless steel selected for its resistance to corrosion and rust. Diamond Laser blades are coated with the finest diamond abrasive. The diamond coating allows the blade to glide through glass and stone cleanly and easily, minimizing grinding time. The thin cutting edge means intricate cuts are possible with minimum chipping and cracking. Fits Diamond Laser 4000 and 5000 band saw models. Blade Life Estimate Approximately 80-100 Hours. Cutting time will vary based on material cut and operator experience.